If you love water sports, then you know that buying a pontoon boat is like the culmination of your water adventure. If you are reading this guide, it is because you want to buy a pontoon boat. Good decision! This is a substantial investment since these boats cost a lot of money. However, you will never regret the investment. If you would like to take your water sports to greater heights, go for a pontoon boat. But first… what is a pontoon boat? As its name suggests, this boat is mostly flat hulled and floats on pontoons. Pontoons are hollow pipes filled with air to enhance floating in water. Thus, a pontoon boat is designed to float on the attached pontoons. The reason why we said that it is the culmination of water adventure is because you can use your boat for many purposes. You can use it as your scuba diving platform, for fishing, for entertaining leisure on the water – throwing parties for your family and friends, like a movie star. A pontoon boat comes either double or tri-hulled. There are also smaller inflatable varieties, which are designed for one person. What do you intend to do with your pontoon boat? Thankfully, there is a boat for just about any kind of purpose. If you want a boat that you can use for skiing and tubing with your kids, you want to find one with a powerful engine, and one that is low enough so that you can get in and out easily. If you want a boat that you can use for leisure or for fishing, you need one with a large deck. In addition, if it is a leisure boat, you do not need speed or a very powerful engine. You need large seating capacity, and good space for fishing chairs. If you intend to use the boat alone for your leisure, then it doesn’t have to be too big. The most important thing is to find a balance between specifications, price and your lifestyle needs. For sunbathing, consider looking for a pontoon boat that has a large, slightly raised and comfortably padded deck. Speed doesn’t matter in this case since your skin cannot soak up the sun when moving at high speed. For a boat that you will mainly use to entertain your family and friends, consider food storage, eating space and seating capacity. Step 2: A double or tri-pontoon? 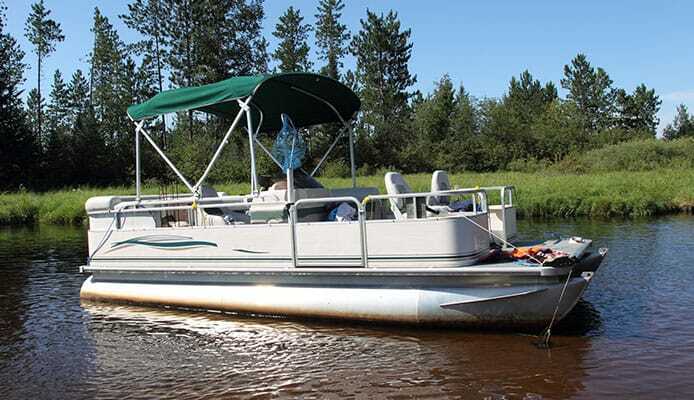 Whether you get a double pontoon or a tri-pontoon boat will be determined by a few factors. For example, if you intend to use the boat on a small lake near your neighborhood, then a double pontoon boat will do. If you intend to use it for tubing with your buddies on a wild river or lake, you can make the motor anywhere between 100 hp and 200 hp. You may consider buying a tri-pontoon boat if you intend to use it for everything. Everything in this case means leisure, skiing, fishing, speed cruising and tubing. Just like buying a car, a higher HP pontoon boat is better. However, it will cost you more, but there are benefits. One of them is that your boat will not get “tired” even when you are entertaining a good number of people. Secondly, when you want to do some high speed cruising, skiing or tubing, get a boat with a 4-stroke outboard motor with high horsepower. Any guide on buying a pontoon boat will tell you that the higher the HP the better. But is that always the case? I would recommend a V6 outboard motor for a pontoon boat that is longer than 24 feet, at least 25 hp for the small boats and for mid-sized boats, a motor of between 75 and 150 hp is good. Buying a pontoon boat is going to cost you a good amount of money. Thus, you want to be assured that you are getting good value for your money. One way in which the manufacturer of watercraft like this one can show his confidence in the product is by offering a warranty. It will not be a comprehensive warranty, but it could be split to cover different parts. There could be warranty to cover the railings, for the motor, another for the seats, the hull and so on. Different parts will be covered by different warranties, the longer the better. Read the terms and conditions governing the warranty to unearth any fine print. One of the things that you want to know is whether the warranty includes labor, and what kind of damage is covered. 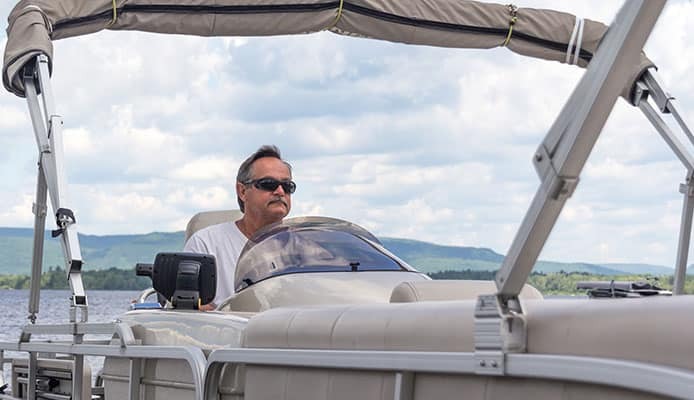 While I have mentioned boat size here and there in the preceding sections of this post, I would say this guide on buying a pontoon boat would be incomplete without mentioning the deck. The deck is the “living space” on the boat. If you intend to sail on small, calm lakes or dams, consider buy a boat that has a deck of between 15 and 19 feet long. This boat can accommodate up to 8 people comfortably. For a pontoon that can handle slightly wild rivers and lakes, consider a deck that is between 19 and 23 feet. This kind of boat can ferry 13 passengers comfortably. If you are considering a kind of a Black Pearl (Remember Captain Jack Sparrow’s ship, Pirates of The Caribbean?) speed and maneuverability, consider buying a pontoon boat with a large deck, of between 23 and 28 feet. Again, I hope you remember where I mentioned that such a boat (24 feet and bigger) should have a V6 outboard engine. This large boat can accommodate 15 passengers comfortably, perhaps more. We might shout about features, size, engine and so on until the chickens come home to roost. However, when it comes to the budget… that is where rubber meets road. The long and short of it is; the bigger the deck and the engine, the costlier it will be. Depending on the extras that the boat is fitted with, the cost will rise even higher. A decent pontoon boat can cost you anywhere from $14000. On the other end of the spectrum, it could be up to $50000. Tell you what though, it is never about the cost of buying an item. It is about the value that you will derive from that item. I hope that after reading my small guide on buying a pontoon boat, you can go out there and find something that you will fancy for a long time. If you love water sports as much as I do, then you know that a pontoon boat is the Holy Grail for any water enthusiast and that no cost will stand between you and your favorite boat. Thankfully, these boats retain a good resale value, and you will enjoy using yours very much.